Home › Energy-Efficient LED Lighting › Surlight Led Falling Rain Lights With 30Cm 8 Tube 144 Leds Meteor Shower Ligh..
Surlight Led Falling Rain Lights With 30Cm 8 Tube 144 Leds Meteor Shower Ligh..
High Quality & Energy Efficient: Dustproof; transparent PC material, corrosion resistant, cost resistant, aging resistant, more durable; free from time and space constraints. Low power consumption and energy saving. 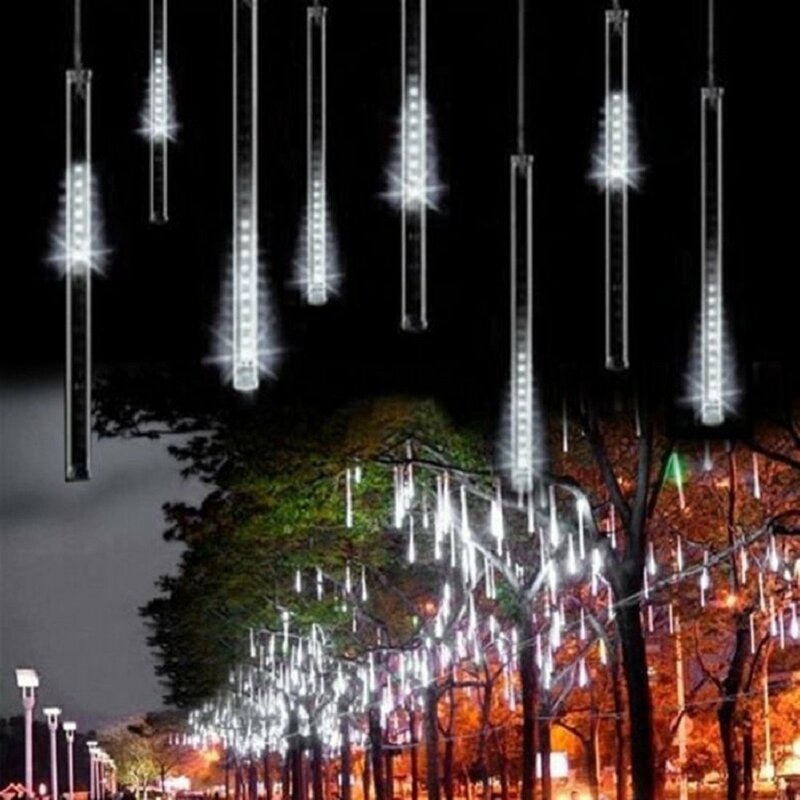 Meteor Shower Effect with Romantic Aesthetic: Led meteor shower lights, the light of every bulb turns on and out one by one in sequence and quickly just like meteor shower or falling snow in the night sky, very beautiful. It can be used as one or be connected (as many as five string lights). Holiday Decoration: As Icicle Snow String Lights, also as LED Cascading Lights are perfect for Christmas, New Year, Wedding, Party, Valentine's Day, Business Celebration and any celebrating time. Suit for Homes, Gardens, Lawns, Patios, Christmas Trees. Application: market engineering lighting, architectural decoration, decoration of trees along streets, parks, river, urban night lighting, attractions landscaping, gardening, community night crystal decoration, hotels, shopping malls, night entertainment all over the environment decoration. Package Includes: 1 x SurLight Falling Rain Meteor Show Light; 1 x US Plug; 30 Days Money Back Guarantee and 90 Days Warranty; 100% High-Quality & Friendly Service and 24-hours Email Response; if you have any problem, please email us freely. Noted:1. Please note that the plug is NOT waterproof so that please keep the plug away from water.2. Please make sure the male/female connectors are connected correctly. If you can not turn on the light, it is caused by the false connection for the connectors, please disconnect them and change another direction to connect them again. Specifications:Plug types: US PlugLED bulbs of per tube: 18Tube Quantity: 8 TubesNumber of LED bulbs: 8 Tubes x 18LED (144LED Lights)Tube length: 30cm/ 11.8inchTube Dia. : 1cmTotal length: 320cmWorking Voltage: 110V-220VWatt: 5W SurLightTrustworthy New Brand with 30 Days Money Back Guarantee and 90 Days Warranty and 100% Satisfaction GuaranteeIf you have any problem, please email us freely, we will provide the best after-sales service for you.